The past, the present, and the future of every animate and inanimate being in our universe is defined by its interdependency with everything else. This web of life transports and transforms vital energy within and between Nature’s creatures. If any of these links are broken, Nature on any scale could be severely hampered or not operate at all.This short video summarizes the content of my blog site. Everything, including ourselves, is connected to everything else. Conservation is the act of identifying and preserving these interconnections. Hope for mankind comes from instilling a deep connectivity consciousness in our youth. Over the years, I have maintained a list of Internet resources for various subjects regarding Nature. You can view this list by selecting the “Online Resource Lists” menu item. Meaningful environmental education is a critical conservation tool in this modern society where we need to instill a consciousness for Nature with our youth. 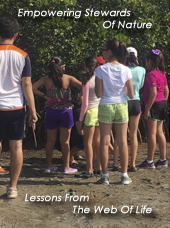 The “For Environmental Educators” menu item offers resources for teachers, docents, and mentors. This section will continually evolve as new teaching material is developed. Nature’s inter-connectivity makes beautiful pictures. Explore “My Nature Photography” gallery by selecting that menu item. And finally, you might want to learn a little about me. The “About Me” page also gives you the opportunity to contact me via email, Facebook, or Twitter. I would love to engage in a dialog with you.